David Lean may not be known primarily for his comedies, but the two he made—1945’s Blithe Spirit, based on the Noël Coward play, and then Hobson’s Choice in 1954—were exceptional, combining expertly timed broad humor with his always refined sense of Englishness. The gorgeous black-and-white Hobson’s Choice is the more sublime of the two, ranking with the best Ealing Studio features of the period, well-known for their mirth and gentility. Yet it boasts a special distinction from the Ealing tradition, molded as it is by the sharp mind and artful hands of a meticulous cinematic visionary. By the time of Hobson’s Choice, Lean was a proven master of storytelling, not through “perfectionism” but his exacting creation of mood, established by concentration on tempo, ambience, environment, and detailed behavior. No Ealing or Gainsborough comedy surpasses the polished gleam of Hobson’s Choice. Its brassy characters—blustery boot shop owner Henry Hobson (Charles Laughton), his stern eldest daughter, Maggie (Brenda De Banzie), and the timid shoemaker she marries, Will Mossop (John Mills)—are large-scale emblems of the British class system, representing its range of clashing types. Depicted with rousing vivacity, they inhabit an early twentieth-century setting that Lean conveys with his widely admired, signature sense of the real physical world; the polished-pewter beauty of Jack Hildyard’s black-and-white photography gives even the cobblestone streets a tactile dimension. Lean developed this hyperrealism as part of his cinematic character portraiture—investigating British manners through archetypes that would be amusing and enlightening and, above all, as eminently recognizable as a Manchester street, an Edinburgh town house, a London flat. That was the gift of Lean’s apprenticeship with playwright and theater titan Noël Coward. They worked together on the 1942 World War II film In Which We Serve, and also collaborated on the patriotic overview This Happy Breed (1944), a derivation of Coward’s earlier British family epic Cavalcade (filmed by Frank Lloyd in 1933). The Lean-Coward films were not middlebrow jingoism; in each one, Lean showed an appreciation of how individual behavior—and the look of average lives—defines the national spirit. Theater suited Lean’s preference for framing characters in a way that makes it possible to understand their existential circumstance and spiritual nature—best exemplified by his adaptations of Coward’s plays, especially 1946’s atmospheric Brief Encounter. This scrutiny of British behavior was famously elaborated in Lean’s Dickens adaptations Great Expectations and Oliver Twist—literary-cinema master­works that combined imaginative folklore with classical British narrative tradition. Lean gave that tradition new life in Hobson’s Choice, based on a theatrical warhorse by Harold Brighouse, first performed in the United States in 1915, perhaps as a caricature of Englishness. But Hobson’s Choice was soon thereafter embraced by Britons, who approved Brighouse’s farce as a genuine reflection of their own culture, habits, and humor. Lean responded to the play’s vintage qualities, adapting it with the same inspiration he had Dickens—telling Henry, Maggie, and Will’s story as imaginatively and as vividly as possible. Starting with Malcolm Arnold’s boisterous score, Hobson’s Choice boasts an English music-hall spirit that connects this theatrical artifact to the popular realm of mass entertainment, but made sophisticated, as always with Lean. As a cinematic craftsman, Lean surely related to this story of skilled Manchester laborers whose personal drives pursue high standards of material quality, moral behavior, and social esteem. It is Lean’s dramatic expertise and elegant workmanship that transform a crowd-pleasing formula of combative egos into a revelatory romance. The rousing and hilarious clash of wills—the father wrestles with his loss of authority, the daughter fights for her individuality, and the workman gains self-esteem and self-determination—preserves the midcentury concept of Britain as not only an empire but a land of articulate and ingenious authoritarians, legislators, and proud laborers: the British character idealized. As in so many Lean films, the eccentricities displayed by Henry, Maggie, and Will are observed, revealed, and discovered to be timeless human attributes, as in classic British literature. Their comic actions recall the histrionic undercurrents that propel the Dickens melodramas. Laughton’s bumptious patriarch mourns his waning authority when stern Maggie acts against her impending spinsterhood by setting her sights on Will. Already the functioning head of the family—taking the place of her deceased mother, even bossing around her two younger sisters—Maggie defies her father’s oppression. “The dominion of one woman is paradise to the dominion of three,” Henry complains to his cohorts at the Moonraker tavern. Lean favors each of Henry, Maggie, and Will’s chosen prerogatives even as they are in hilarious conflict with one another. In this way, Lean satisfactorily enhances the Coward method, humanizing the most outrageous quirks of the British class system. Henry drowns his loss of control in drinking, Maggie effects her own emancipation, and Will gradually acquires his manhood and comes to social consciousness. Their development should be taken no less seriously than that of the protagonists of Lean’s more famous dramatic films, since Lean applies the same fascination and affection here; this gives Hobson’s Choice its comic strength. An examination of the empire’s social manners and psychology is always at the core of Lean’s narratives. When patriarchy’s silly privileges (power and drink) go up against unstoppable forces of temperance, love, and early twentieth-century feminism, Hobson’s Choice soars as a lampoon challenging the old order. Male tyranny is easily subverted through the functions of expert comic plotting. Henry may rant against the “rebellious females of this household,” but Maggie’s determination to have a man who loves her and a life of her own design becomes a viewer’s delight. One roots for Maggie, an underdog heroine whose virtues show in De Ban­zie’s middle-aged figure and beam­ing, emotionally open face. The opposite of Ann Todd’s emotionally secretive heroine in Lean’s 1949 Madeleine, Maggie refuses to be subjugated; her liberation is the obverse of Madeleine’s sexual, legalistic tragedy. The title Hobson’s Choice comes from a familiar expres­sion meaning lack of options; the play extends that meaning to Henry Hobson’s inevitable giving in to his daughter’s growing empowerment. Maggie doesn’t acquiesce to her father’s rule but acts on her own behalf. It is Henry who, ironically, has no choice and must accept the circumstances of Maggie and Will’s marriage and business venture. In commiserating with Maggie’s ambition and dynamism, Hobson’s Choice has remained fresh—a bona fide portrait of British manners that’s been relevant over decades of political change and comedic fashion. To contemporary viewers, Maggie may even suggest a proto–Margaret Thatcher entrepreneur. Maggie’s drive toward privatization as she rescues Will from drudgery impresses on several levels. She tells him, “You’re a business idea in the shape of a man.” As they escape his dull marital prospects and his certainty of financial and spiritual impoverishment, Will exclaims, “It’s like a happy dream!” This doesn’t cast Lean as conservative—look how he provocatively stages Will’s admission: the lovers are poised in a narrow archway, the sunlit background of housing projects and satanic mills suggesting their indeterminate future. Images just that expressive and precise prove Lean’s mastery; it’s the personal touch—like Will’s boot-making expertise—apparent in whatever genre he essays. Celebrated as a “perfectionist,” Lean shows an exacting, superb craft in visualizing a scene, staging characters and situations to bring out larger meaning. The first, high-angle shot looking down on Will in his cellar workroom cuts off the top of his head as the camera moves in—but not too close. It matches the scene where Will is angrily summoned by Henry, who is viewed from a low angle—not too close but leaving Henry’s head cut off as well. These compositions analyze the prospects of masculine authority and subjugation, both on the verge of change. Lean’s imagery always catches his actors’ precision, and never more so than in this film. The camera tracks De Banzie’s fastidious ardor; a close-up shows her first sign of affection when she excuses Will’s semi-illiteracy: “It’s the italics which makes it difficult for him.” Laughton’s Henry Hobson is an uproarious comic turn, from the moment he runs up a staircase with Lean’s vertiginous angle conveying comical tipsiness to the singular midnight caprice when he drunkenly stalks the moon’s reflection in rain puddles. He evokes a Chaplin ballet, but he’s actually an existential acrobat. Hobson’s moods are larger-than-life theatrical, yet Lean’s style makes them quintessentially cinematic. When he finally falls into a cellar, it’s as if descending from the moon above. This phantasmagorical image is the link between Lean’s professed fondness for Orson Welles’s chiaroscuro and Laughton’s fantastical The Night of the Hunter. 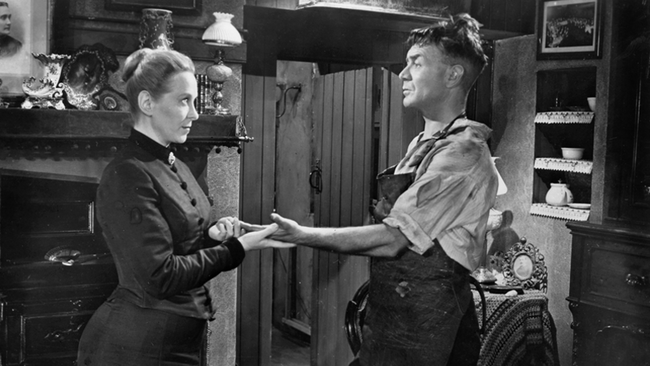 Folksy humor might conceal the rigor of Lean’s formal artistry in Hobson’s Choice, but the illustration of English social custom and sexual manners makes it as profoundly expressive as Lean’s bigger movies. The opening pan of assorted shoe silhouettes, a range of family sizes, introduces the Hobson family turmoil. It then coheres with Maggie and Will’s courtship, their gradual steps taken against neorealist backdrops of northern England’s smokestacks and polluted rivers. Altogether, a typically Lean-rich vision of man in his environment. Through this story of thunderously, wondrously henpecked men and a determined woman’s romantic zeal, Hobson’s Choice depicts private and social revolution. As the bedroom door closes on Maggie and Will’s wedding night, Lean transcends smirky innuendo; his slow pan left enlarges the tale, describing a house being put in order. No other romantic comedy has been more telling yet discreet. Armond White is film critic for the New York Press and 2009 chairman of the New York Film Critics Circle. His expanded essay What We Don’t Talk About When We Talk About Movies is forthcoming from Resistance Media.